Hi Simon M and RoyC, am I too optimistic to hope that your silence indicates that you are considering what to do about this? But I guess that does not prevent a UML solution (e.g. EA) to add a feature of saving ’orphan’ tagged values (and possibly even trying to convert them into the new tagged values belonging to the new stereotype. It could be an option in the settings. If you choose the new stereotype from the drop-down-box in the properties window – then the tagged values with common namespace actually do survive. If you dragt it from the tool box and “Apply …” it, then it adds the new stereotype (the element now having two steretypes). Sometimes the new stereotype becomes the last stereotype in the stereotype list for this element – sometimes not, I haven’t figured out how this works. This is actually one reason why users often delete the old stereotype from an element - before they apply a new stereotype for the element. @RoyC: ”why … take the defining stereotype away again”. 3: it also happens by accident – and even though it may not be very often its impact increases by the fact that the user often does not notice, that all the tagged values have disappeared. There may be 20 tagged values which each represents considerable analysis time and interview time with business people. 4: Sometimes, users want/need to change stereoypes simply because they get more clarified of what they/others really are talking about (during an analysis phase quite a lot of concepts can be very abstract/fussy initially). Usually this does not lead to a change in stereotype, but it does happen. I guess this scenario is part of point 1 and 2. @RoyC: ” If someone deletes a stereotype by accident … you can restore … Tagged Values by dragging the stereotyped element from the Toolbox over the 'broken' element in a diagram." @Simon: This is quite an issue for the use of EA in my Company (CPH Airport) - and we don't see any work-around for it. I really don't know what to do on this - we are in trouble! @qerty: Thanks for the input. OnContext event - I don't know it, it seems to be something that Add-Ins can use - but I don't write Add-Ins. Can I use it in EA scripting (JScript)? - I do write EA scripts. I have created Stereotypes in MDG. When I remove/change the stereotype on an element in my model, it looses the tagged values associated with the stereotype. ResourceObj specializes BusinessObj which specializes Obj which extends Class. Obj carries the tags which are common for all aobjetcs etc. My problem is, if a user changes/removes the stereotype on an element, all the tagged values are delted - and often the user wants to keep/transfer the tagged values. Or maybe the user just removed the stereotype from the element by an accident. So EA Object Model does not support testing if an element has a given stereotype with a given namespace like "CPH_MetaModel::Application"? Thanx, qwerty, that works just fine. But new challenge: How do I see the full name of the existing stereotype? Automation Interface, Add-Ins and Tools / Specify one of more stereotypes with same name? In EA script, How do I specify which stereotype when there are more stereotypes with the same name? They have different namespaces. But how do I specify the one I need in an assignment like: Obj.StereoType = "StTypName"
Automation Interface, Add-Ins and Tools / Re: How do I move an element to a new parent? Automation Interface, Add-Ins and Tools / SOLVED: How do I move an element to a new parent? In an EA script, I want to move an element from one parent element to new parent element. OK, sounds good, then I'll wait for EA 11. Can you indicate when this might be? BTW: So the way, I used the specialization is OK? The model in the top post works except the grouping of tags is it it ignored at the specialized stereotypes. The tags are there, just not grouped. I will fall back on that, if I don't find other solutions. When I use the three <<stereotype>>s ”ProcessObj”,”ResourceObj”,”ReferenceObj”, they all have inherited the tags from ”Obj” – so far so good. BUT: the tags are not grouped according to the tag groups – in fact they don’t seem to have the tag groups (although the tags themselves are all there). If I double check by including the ”Obj” in a toolbox in the MDG file, the ”Obj” does have the tags grouped properly. I have many stereotypes sharing a common set of base tags. Is this not the proper way to do it? I’m not familiar with how to use the Metatype, but have tried different variations without that solving this issue. Does any body know how to do this (sharing a common set of tags)? 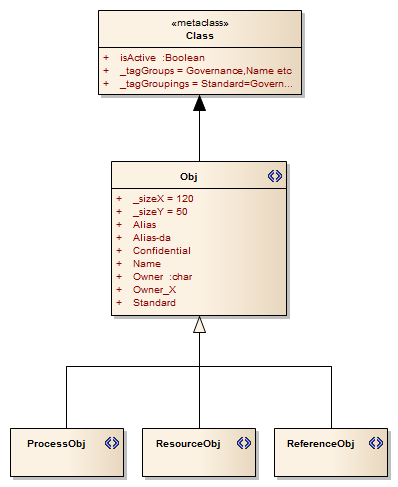 Also: Am I using the ”Generalization” connector in a wrong way in my UML profile? Automation Interface, Add-Ins and Tools / Re: Accessing EA objects from HTML embedded in EA? - inside EA, opened/displayed on request from EA elements etc. 1) Reuse of code and logic also to be implemented on a web/app server accessing EA. It would be nice to reuse not only search logic and presentation, but also other logic and presentation implemented on a web solution. That would also give the users a common interface between EA and the WEB presentation of the repository. I realize that the logic (e.g. fuzzy search logic etc - could be reused by calling for instance a web service) - but I'd be happy to reuse also the HTML GUI. 2) I like the layout/presentation styles of HTML pages. 3) Reuse of skills. Alternative is Visual studio? - I don't know that development environment (I guess you developed your EA Navigator in Visual Studio?). PS: I want to open the HTML page in an EA window, possibly the standard pane where EA opens HTML pages. - triggered by e.g. the user choosing from a context menu on a given element.